Slip Associates can supply, distribute and fix a non-slip flooring treatment for tiles and natural stone. Slip Associates can carry out slip assessments testing using the very latest equipment, approved by the HSE. Slate flooring is becoming an ever more popular option for use in the home. Slate flooring is a hard wearing and durable product and is suitable for areas that experience more than their fair share of wear and tear. However as with every type of flooring there are inevitably pros and cons. Westcountry flooring based in Wadebridge, Cornwall give insight in to a few of the advantages and disadvantages of using slate flooring in the home. Slate is a natural stone and is waterproof, making it a good choice where moisture may be present, e.g. a bathroom or kitchen. Slate is very durable and doesn't require much maintenance. Also due to its dark coloring it hides dirt well, so is ideal for rooms such a kitchen. 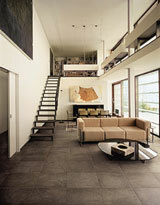 However slate is more expensive than other natural stone flooring types and can also be very cold underfoot. As long as the slate flooring is installed on a proper sub-floor, your slate flooring should be highly resistant to any kind of damage. If you have any doubt about the suitability of the surface where you want to install your slate flooring, it is best to consult a professional before you attempt any installation procedures. Here are some advantages and disadvantages of slate flooring, supplied by Cornwall Slate flooring specialists Westcountry flooring. Slate is a tough stone that can take a beating. Slate doesn't just come in grays and blacks but in a range of beautiful, subtle hues that can enhance many decors. Slate is expensive in comparison to other flooring materials (though unlike with granite and marble, a do-it-yourself type can install it). It's cold and hard underfoot. If highly polished, slate can be slippery. Slate floors don't absorb sound very well. In Cornwall our wide choice of slate allows any colour scheme to be complimented and at the same time will suit any domestic or commercial property, whether you are looking for a traditional rustic look or a more contemporary feel.